The drills and exercises in this video will allow you to improve ankle mobility over time. You’ll finally be able to get into that beautiful deep squat position! If you lack ankle mobility, you are likely to have a lot of forward lean in your squat. Your hips stay up in the air and your chest falls forward. You feel like you can’t bring your hips lower without falling over. First, mobilise the ankle using your own bodyweight. Then work the deep squat position using a solid upright object for balance while you squat. It’s fun to try the duck walk! It might look a bit silly but it will really work your ankles. 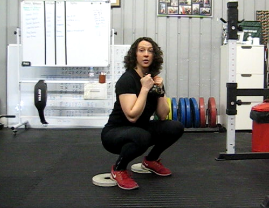 Finally, use goblet squats to drill your squat position and improve ankle mobility. Elevate your heels on small plates or the edge of a platform if necessary – it will actually help your squat position in the long run. Tight calves – often from running long distances or wearing high heels for long periods of time. Old ankle injuries – it’s easy to injure the ankle and once an injury has occured, the ankle may lose some mobility during the healing period. Lower body injuries – an injury elsewhere on the lower body, such as knee or hip, can cause compensatory patterns that result in the ankle being restricted.